Obituary for Terry Charles Bruce | Grays Funeral Chapel LTD.
Terry Charles Bruce passed away peacefully on Wednesday, March 20th, 2019 at the age of 70 years at the Victoria Hospital in Prince Albert, SK after a battle with cancer. Terry was born at the Holy Family Hospital in Prince Albert, SK on July 3rd, 1948 to his parents: Charlie “Charles” Bruce and Eleanor “Vinnie” Bruce (nee: Gale) and was one of five children. Terry grew up in the Wild Rose district and attended Wild Rose School. At a young age, he enjoyed riding horses on the farm, attending community dances, as well as playing baseball, hockey and curling. 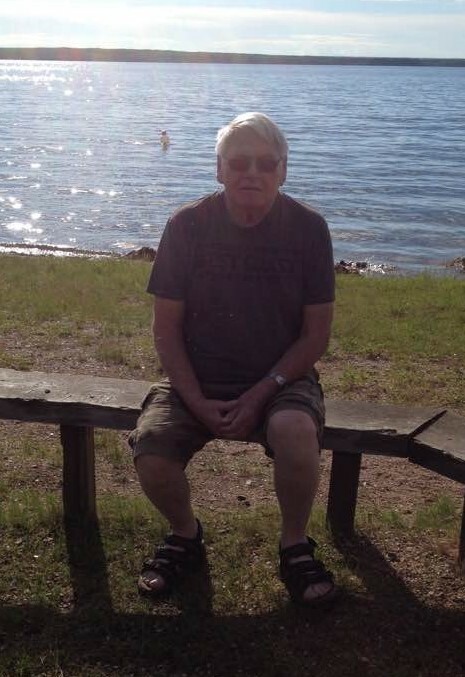 One of his favourite memories as a boy was having picnics with his family at Sturgeon Lake. Terry enjoyed the outdoors and his favourite hobbies included hunting, fishing, gardening and watching sports, especially the Saskatchewan Roughriders. Through most of his life, Terry worked as a Heavy Machine Operator. His favourite machine was the grader. Before his retirement in 2014, Terry worked at Broda Group for 20 years, where he was well respected by his co-workers. Terry will be lovingly remembered for his great sense of humour, his skilled work ethic, and his willingness to listen. He loved spending time with his children, grandchildren, and great-grandchildren. Terry is survived by his children: Christina (Kelly) Smith, Shona (Robert Hill) McArthur, and Wade Bruce; his grandchildren: Tanya (Cody Lemieux) McArthur, Tasha (Stephan Kopchynski) McArthur, Dylan Bruce, and Damien Bouchard; his great-grandchildren: Nash, Oakley, and Brax Weathered, and Fynn Norton; his sibling: Darlene (Ray) Lafond; as well as numerous nieces, nephews, and cousins. Terry was predeceased by his spouse: Rhoda Settee (2010); his parents: Charlie “Charles” Bruce (1992) and Eleanor “Vinnie” Bruce (nee: Gale; 2002); his siblings: Carol Bruce in infancy (1951), Roland Bruce (2013), and Audrey Wisbey (nee: Bruce; 2015). The family would like to thank Dr. Cantin, Prince Albert Home Care, and the staff of Level 6 at the Victoria Hospital. A Private service will be held with close family and friends. Donations in Terry’s memory can be made to the Canadian Cancer Society, 54 11 St E, Prince Albert, SK S6V 0Z9. Condolences may be sent to the family at www.grays.ca. Funeral arrangements have been entrusted to Gray's Funeral Chapel.